Hey y’all, I hope the last two weeks have been great! As you can see I’m bad at time management and failed at writing last week once again. Something that the Lord has been teaching me recently is finding comfort in Him. The past few weeks have been pretty rough for me, and my anxiety/PTSD have been awful. I had to face some big scary things from my past and will be dealing with them indefinitely, and it is causing me to have awful nightmares and sleepless nights. So even more than usual I am having to trust in the Lord and trust that He is the ultimate protector and will keep me safe. He is bigger than my anxiety and my panic attacks. This week at church, during worship we sang several songs that were about praising the Lord in trials and hardships, and that the Lord is fighting for us, even when we don’t know it. It doesn’t matter where we are or what is happening because God is bigger and greater. The last couple of weeks it kind of felt like the Lord wasn’t fighting for me, and I was continuously crying out to him, asking why all of this was happening to me, and while I still don’t know the answer and while I still don’t like it, I know that He is fighting for me, He is keeping me safe, He has everything under control and has a plan for it, and will never ever leave me. I also know that He has provided me with amazing friends and an amazing community to help support me during this. But no matter how great that community is, or how great those friends are, they can’t comfort me like God can, He is the ultimate protecter, and comforter. So whatever you are going through, whatever feels like the Lord has abandoned you, remember that He is fighting for you in ways that you don’t even know and remember that He is the best protector we could ever have. Find comfort and rest in the Lord this week. 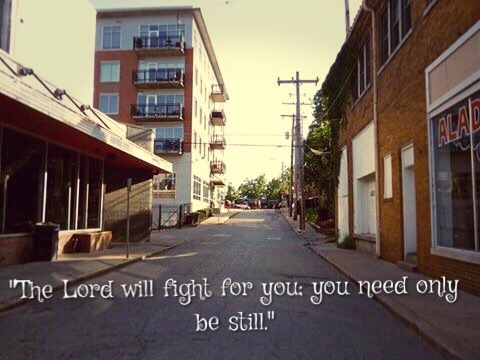 This entry was posted in Christian and tagged God is fighting for us. Bookmark the permalink.